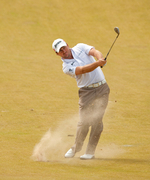 Picture Stuart Adams /www.golffile.ieHarrington, meanwhile, added a 67 to his opening 69 to lurk just three shots back on eight under and prove that the positive noises he has been making about his game of late are not just talk. The Dubliner has now broken 70 in five of his last six rounds and while he admitted that he could have holed a few more putts on Friday, he is happy with his form ahead of the season’s third major. However, the world No 57 will have to play some of his best golf in years to have a chance of overhauling an inspired McDowell over the weekend. Last year’s US Open champion had an eagle and six birdies in his 64 to share top spot with Scots Peter Whiteford and Scott Jamieson when play was suspended for the second time in the second round due to thunderstorms. “The course was there for the taking. If you don’t get the elements, then it will be taken apart and that was kind of how it was out there. McDowell knows he has the game to win an Open and after some decent starts in recent years, he’s hoping he can challenge to “The Man”, as he now calls his friend McIlroy. “I feel quite fresh in my mind. That ought to be something to do with the way I felt at Congressional. I felt at Congressional like a subconscious weight had been lifted off my shoulders. I really shouldn’t be complaining about the burden of being the US Open champion. McDowell plays his second shot into the 9th. 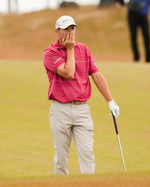 Picture Stuart Adams /www.golffile.ie“I had a great 12 months and played some great golf, but it had a negative side to it. I really wanted to push on with my game and I didn’t really feel like I could. I’ve talked before about spending all of my time reliving 2010. “I feel really good now. There’s another Northern Irishman to take all the attention off me this time. I’ll let him handle that stuff and I’m very happy to push on and get back to winning tournaments. I’ll maybe play a practice round with ‘The Man’ next week. 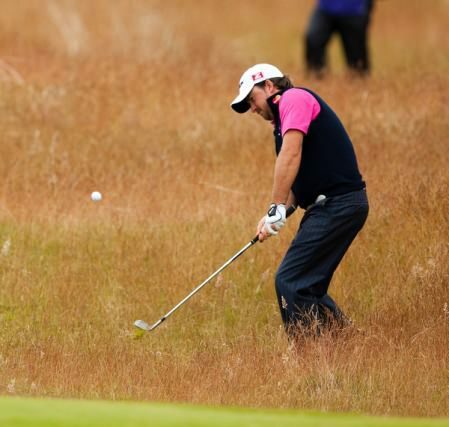 If McDowell felt obliged to go low, Harrington also felt pressure. The cut will fall at three or four under par, which is good news for the struggling Damien McGrane as fired a 67 to finish on four under for two rounds. 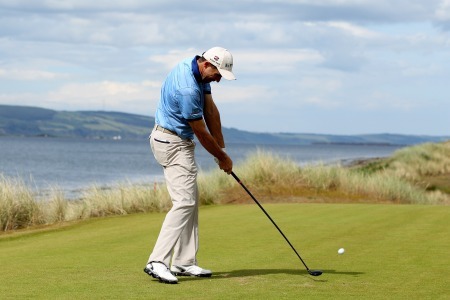 Padraig Harrington chips out of a near impossible lie at the 18th hole during the second round of the Barclays Scottish Open. Picture Stuart Adams /www.golffile.ie 8th July 2011Gareth Maybin faces an anxious wait after a 68 left him on three under while the rest of the Irish will resume the second rounds at 7am today. Peter Lawrie was six under for the tournament, 2 under for 13 holes, alongside Darren Clarke, who had played his first eight holes in three under when the hooter sounded. Paul McGinley was a shot further back on five under, two under for the day through 11 holes with Shane Lowry on four under after two birdies and a bogey in eight holes. Like McGrane, Lowry would love to make the cut and end a miserable run of three failures in a row that includes the US Open, the BMW International Open and last week’s French Open. Graeme McDowell plays a fairway bunker shot on the 18th at Royal St George’s on Monday.Graeme McDowell is patiently waiting for his midas touch to return as he targets Open glory at Sandwich this week. The Ulster ace, 31, was Mr Golf last season as he won the US Open and the Ryder Cup and then downed Tiger Woods in his own back yard. But he’s been dogged by disaster this term and racked up big numbers at exactly the wrong time.